There have been almost as many technological advances in ground water treatment in the past 30-years as there have been years. The cost of groundwater remediation is so great that much research time and funding has been devoted to finding faster, more cost-effective methodologies. Common technologies used to treat contaminated groundwater include air stripping (above), air sparging, granulated, activated carbon absorption (GACA), oxygen-releasing compounds (ORCs), soil vapor extraction (SVE), and the old standby natural attenuation. In addition to drinking water testing, Federated Environmental offers groundwater testing for all of the same parameters tested for in drinking waters. In order to make a determination whether contamination exists on a property, or to determine is a property has been successfully remediated, it is necessary to test the groundwater for the known contamination. Groundwater samples can be taken from drinking water wells, monitoring wells, springs, pits, ponds, lagoons, and leachate or seeps areas. Federated Environmental offers these specific testing services as needed. Many states differ in their regulation of groundwater contamination. The variation in regulations is usually associated with kind of contamination, kind of property, and location of property. Many states simply approach each contamination case and make judgments based on a risk assessment of the property’s condition, which includes the above factors among others. Federated Environmental has extensive experience in performing such risk-based assessments, and negotiating with regulatory agencies to determine the most cost-effective and expedient means to manage groundwater contamination problems. In some areas of the United States, significant groundwater contamination exists for many square miles (e.g., Phoenix, Arizona, Los Angeles, California, and others). Federated Environmental can develop and execute a specialized groundwater testing plan that will determine the identity, and thus the source, of contamination. Under the Illinois “Self-Initiated Cleanup,” Federated Environmental was hired to design, install, and monitor a groundwater remediation system to handle toluene contamination. Toluene is a regulated solvent and is commonly used in hundreds of chemical production processes. The contamination of the groundwater resulted from many years of herbicide/pesticide manufacturing activities rather than from a specific release incident. The system included a plate air stripper and a carbon polishing unit. Federated Environmental obtained all of the necessary air permits, discharge permits, and permits from the City of Chicago. The groundwater cleanup program included an operation plan for the plant personnel to use in case of emergencies or simple repairs. Based on our calculations, the system will be running until the year 2007. Most larger environmental companies have installed groundwater remediation systems at gasoline stations. However, what occurred at this site is interesting. Read on! Federated Environmental was hired to design, install, and monitor a granulated activated carbon adsorption (GACA) groundwater remediation system at a gasoline station being upgraded to include a “quick stop” delicatessen and convenience store. The system was installed in 1989 and permitted to pump 24 hours a day (with a groundwater height on/off switch) for three years. 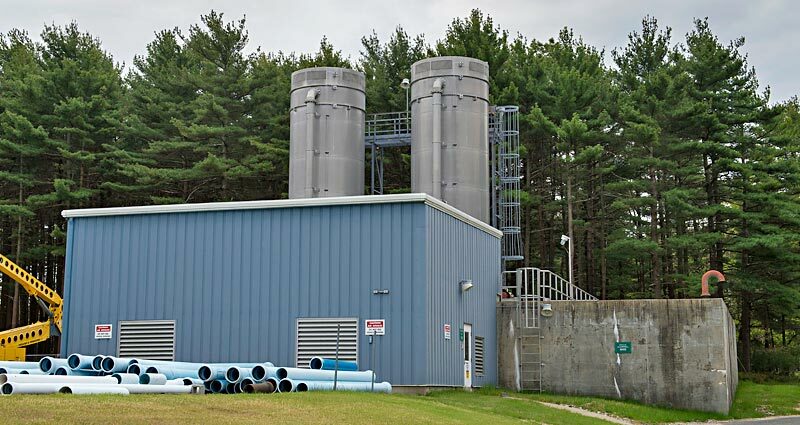 After a year and a half of pumping, the test results seemed to indicate that the groundwater contamination concentrations were not dropping appreciably. However, by the third year of operation the total BTEX levels dropped precipitously and the State of Maryland granted permission to shut off and remove the system. Within two weeks of getting closure from the State of Maryland and authorization to stop pumping, a gasoline station construction company broke a buried fiberglass gasoline transfer line while installing steel gas pump protection barriers. The break in the transfer line resulted in the loss of over 1,200-gallons of additional product. The New Jersey Department of Environmental Protection (NJDEP) required that Federated Environmental recommendations be completed. Never assume a property’s soil and groundwater are clean because any releases that may have occurred occurred long ago and have probably “washed away.” Certain subsurface conditions either contribute to or hinder the natural attenuation of contaminant concentrations. However, it’s not at all uncommon to discover gross contamination from releases that occurred 30, 40, 50 and more years ago. A Phase I Environmental Site Assessment is only a speculative judgment and not scientific certainty. Testing is knowing.